Mo Chit BTS Station, one of the busiest stations, puts you at the doorstep of Chatuchak Weekend Market, Or Tor Kor Market and Rot Fai Park. It also connects with MRT Chatuchak Station. Please note that Victory Monument BTS Station has a different name in Thai (อนุสาวรีย์ชัยสมรภูมิ, Anusawari Chai Samoraphum) and this is the more widely used name for this station amongst taxi drivers and locals. This station is your gateway to the beautiful heritage houses and museum at Suan Pakkad Palace, King Power Duty Free Mall and the Baiyoke Sky Hotel’s 360-degree revolving view deck. 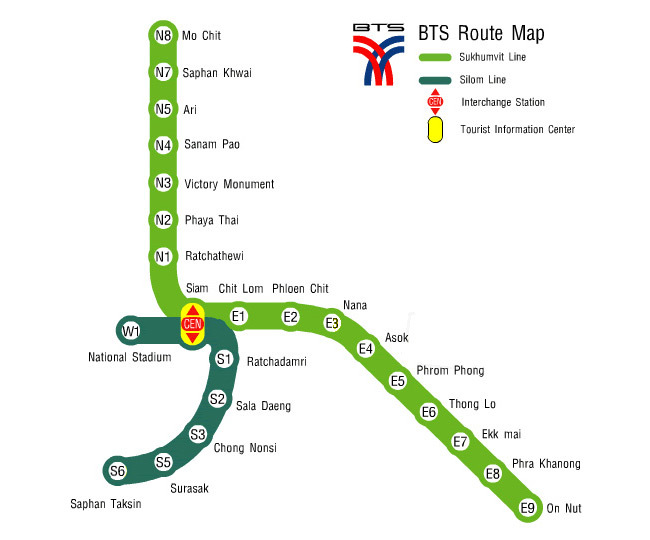 It also connects the BTS with the Airport Rail Link, which zips across the city to Suvarnabhumi Airport in just 15 minutes. The Baiyoke Tower, which is a few minutes’ walk from Phaya Thai BTS Station, became famous in Bangkok when it opened in 1997 as Thailand’s tallest building, measuring nearly 1000 feet tall. As well as this huge tower, the surrounding area is popular for shopping, and the sprawling Pratunam Market can also be accessed from Phaya Thai BTS Station. This market specializes in cheap clothing, accessories and souvenirs. Ratchathewi BTS Station is just a few minutes’ walk to Pratunam – the epicentre of wholesale clothing and wacky street fashion. If the thoughts of ladyboys with tremendous stage talent pique your curiosity, head over to Calypso Cabaret at the station’s very doorstep. Elsewhere, there is also the lively Coco Walk (exit 4), which is comprised of rows of fun Thai-style pubs with live music, cheap drinks and live sports on the weekend. For those wanting to access the popular Pantip Plaza (electronics) as wells as Platinum Fashion Mall and Pratunam Market, then Ratchathewi BTS is your closest option. However, these malls are still around 5 or 10 minutes walk, or around 2 minutes by taxi. Please be advised that this area can become very busy during rush hour, and is particularly prone to long traffic jams. Get off at Ploenchit BTS Station and you are really spoilt for choice in terms of dining. Just a short walk away is a collection highly renowned restaurants, such as Elements, Cafe Claire, Tsun Nami and Le Beaulieu. As for attractions, Ploenchit BTS Station is close to the unusual Tubtim Buddhist Shrine, as well as the luxurious Central Embassy shopping mall (which has direct access from the station). As with any central Sukhumvit station, there is no shortage of quality hotels nearby. Several clubs can be found at Sukhumvit 11, including the popular Levels at Aloft Hotel, and some stylish rooftop bars like Above 11 and Nest. The area around Sukhumvit road becomes one huge night market when the sun comes down, as vendors begin to set up their stalls selling cheap fashion brands, accessories, DVDs and souvenirs. This is also one of the prime areas in Bangkok for hotels, with a huge range of three, four and five star hotels just minutes’ walk from the steps of Nana BTS Station. Asoke BTS Station (Asok), one of Bangkok’s busiest business districts, is home to glass-and-steel office buildings, high-end serviced apartments, hotels and a range of stand-alone textile and furniture boutiques. 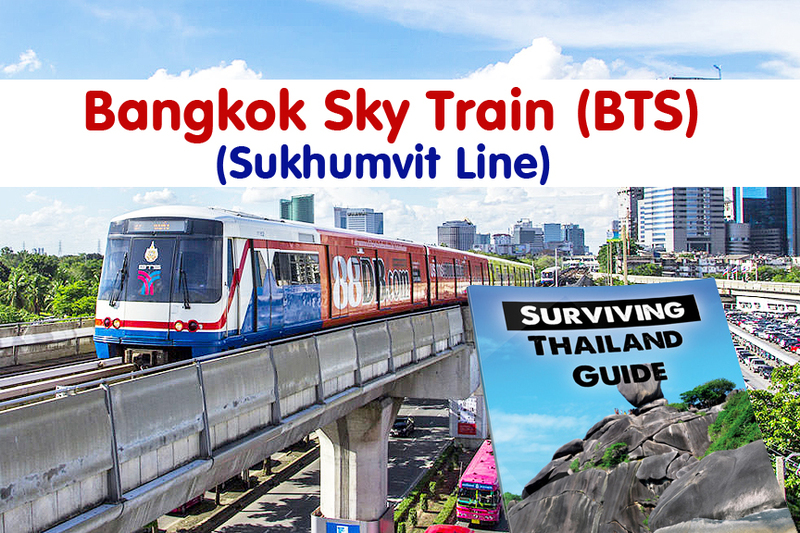 It also connects with the MRT Sukhumvit Station, which leads to the north of Bangkok from the city’s main train station, Hua Lamphong. Asoke is also well known for its fun nightlife scene, and just minutes’ walk from the BTS station is the famous Soi Cowboy – home to numerous go-go bars. Away from the naughty nightlife, there are also plenty of more well-behaved venues such as Glow nightclub, Narz nightclub and the stunning Long Table rooftop bar. The ever-popular Terminal 21 shopping mall is directly accessible from the station. The main attractions near Phrom Phong BTS Station include jogger’s favourite Benjakiti Park, Emporium shopping mall (with direct BTS access) and Rain Hill Plaza (upscale restaurant and shopping complex, around 5 minutes’ away from the station). The main action happens around Thonglor Soi 10, with clubs like Muse, Demo, Funky Villa, Eskobar and Nang Len all packed-out most nights after 22:30. For a slightly more chilled out scene, recommended venues include the uber-cool Iron Fairies and Fat Gutz, as well as Octave rooftop bar and the quirky WTF cafe. There is also some superb street food to be had on Soi 38 and some critically acclaimed restaurants dotted around the Thonlor area too. Bangna is a gateway to the eastern outskirts of Bangkok, with access to the expressways that head towards Pattaya, Rayong and other eastern provinces. The area features many modern shopping malls, restaurants and large-scale regional conference centre (BITEC).